Malaysia's former Prime Minister Najib Razak has gone on trial for his role in a financial scandal that has sent shockwaves around the world. He faces seven charges in the first of several criminal cases accusing him of pocketing $681m (£522m) from the sovereign wealth fund 1MDB. Mr Najib pleaded not guilty to all the charges on Wednesday. The 1MDB fund was designed to boost Malaysia's economy through strategic investments. But instead it allegedly funded lavish lifestyles, a Hollywood film and a super-yacht. A group of supporters met Mr Najib as he arrived at the court in Kuala Lumpur. They stood and prayed with him before he entered the building to chants of "Long live Najib". Mr Najib's lawyers made a last-minute bid to delay proceedings but the judge ruled against them. In the prosecution's opening statement, Malaysia's Attorney-General Tommy Thomas said the "near absolute power" Mr Najib had wielded carried with it "enormous responsibility". "The accused is not above the law," he added. While the former prime minister faces several criminal cases, Wednesday's trial is the first major trial in the scandal. Proceedings were originally set to begin on 12 February, but were delayed for related appeals to be heard. Malaysia's government has also filed criminal charges against Wall Street firm Goldman Sachs, accusing the investment bank of defrauding investors by raising money for 1MDB. The bank has denied all wrongdoing and said it would "vigorously defend the charges". Mr Najib is facing 42 charges in total, mostly linked to 1MDB. The first of several trials begins on Wednesday, centring on the allegations that 42m Malaysian ringgit ($10.3m; £7.9m) was transferred from SRC International, a unit of 1MDB, into Mr Najib's personal bank accounts. The case involves three counts of money laundering, three of criminal breach of trust and one of abuse of power. Mr Najib has pleaded not guilty to all charges. The money involved in this particular trial is thought to be in addition to the $681m that allegedly ended up in his personal accounts. Mr Najib set up the 1 Malaysia Development Berhad (1MDB) fund in 2009, while he was prime minister, to aid the nation's economic development. In 2015, questions were raised around its activities after it missed payments owed to banks and bondholders. The US, one of the countries probing global money laundering, started an investigation saying $4.5bn had been diverted into private pockets. US prosecutors had previously said a person described as "Malaysian Official 1" had allegedly received $681m from 1MDB. That person was later confirmed to be Mr Najib. Prosecutors said the money had been used to fund a lavish lifestyle for the former PM and his wife Rosmah Mansor, who is also facing charges of corruption. Mr Najib was cleared of all wrongdoing by Malaysian authorities while he was prime minister. 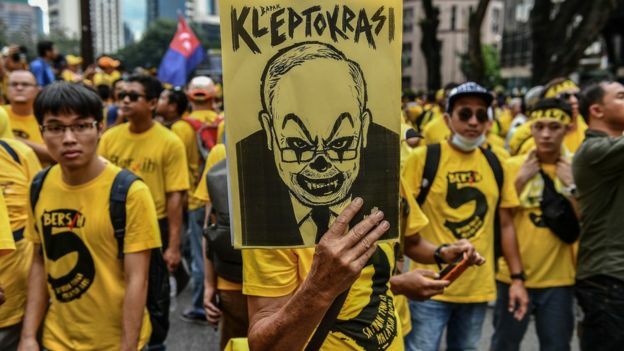 Nonetheless, the corruption allegations played a big part in his historic election defeat in 2018 - and the new government swiftly reopened investigations into 1MDB. 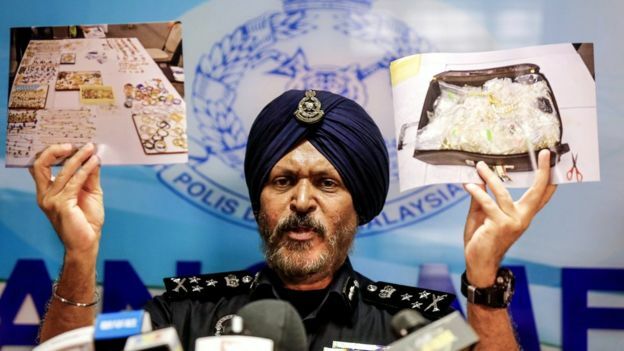 Police said they had recovered luxury goods and cash from Mr Najib's properties, and he was arrested by anti-corruption authorities before being freed on bail. Another target of the investigation is Malaysian businessman Low Taek Jho - known as Jho Low - who played a key role behind the scenes in 1MDB's dealings. He is accused of diverting money to himself and his associates, but has also consistently denied any wrongdoing. His location is unknown. His infamous $250m luxury super-yacht Equanimity, allegedly purchased with money taken from the fund, was confiscated by authorities in 2018. On Wednesday a court approved its sale for $126m to casino company Genting Malaysia, the Malaysian attorney general said, making it the largest amount of money the country has managed to recover from the 1MDB losses. At least six countries including Singapore and the US have launched money laundering and corruption investigations into 1MDB. Investment bank Goldman Sachs is one of the biggest players embroiled in the scandal. Malaysia's government has filed criminal charges against the bank, accusing it of helping to misappropriate money intended for the fund. Tim Leissner, who served as Goldman Sachs's South East Asia chairman, pleaded guilty to participating in bribery and money laundering schemes. Goldman Chief Executive David Solomon apologised to the Malaysian people for Leissner's role in the scandal, but said the bank had been deceived about the details of the deal. "We believe these charges are misdirected, will vigorously defend them and look forward to the opportunity to present our case," the bank said in response to the charges.